Michigan enjoys the four seasons and many outdoor enthusiasts claim that winter in Michigan is the very best time of the year. 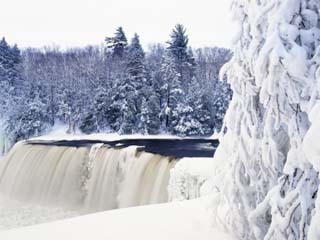 During those winter months, heavy snowfalls in the Upper Peninsula and in the northern region of the Lower Peninsula are commonplace. The Great Lakes area has fairly moderate winter temperatures, but still, daily lows below zero are common across the state. The lakes cool the shorelines on summer days, and humidity is manageable. Average summer highs in the north are near 70 degrees, while in the south, they reach the low 80s. Statewide annual precipitation averages near 35 inches, with slightly higher amounts across the northern reaches of the Upper Peninsula, and along the southern coastline of Lake Michigan. For a more detailed look at annual Michigan precipitation levels, view this precipitation map!